Have you ever driven to work, then realized you don’t remember one single stoplight you passed through or turn you made? Or gotten through a sales meeting and not recall one word you said? Surely you dazzled them with your elevator pitch, but you don’t remember. Why? You were living on auto-pilot. It turns out that the very tendency in our brains that tries to make things easy for us could be the one thing holding us back from living a life of fulfillment and purpose. Isn’t it about time you stopped existing and started really living? 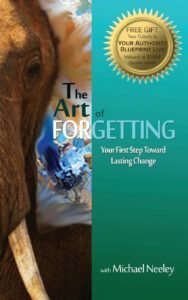 The Art of Forgetting will give you both the insight and tools you need to get out of auto-pilot and back into the driver’s seat of your life. Today’s guest is Devi Adea. Devi is the host of the popular Spiritual Entrepreneur Podcast and is the creator of the Podcast on Purpose Online Academy. Devi brings a unique mix of spiritual entrepreneur, creative, techie geek, business strategist, intuitive, yogi, connector, facilitator, communicator, and coaching genius inside of a single 6-foot tall package. She uses this unique mix of talents to inspire and guide you in experiencing true fulfillment in life by aligning your personal mission, message, and unique mix of gifts with a successful business and values-based lifestyle. If you are wanting to create something that you desire deeply in your heart or to express your soul’s voice and leave an uplifting imprint on the world in service to humanity, Devi is here to help you. You can learn more about her by going to www.deviadea.com. This episode is being brought to you by Your Authority Blueprint Live – the 3-day event that may actually change your destiny! To learn more about this premiere event for visionary solopreneurs and take advantage of the Early-Bird Special, go to www.MichaelNeeley.com or visit HERE for details. NOTE: there are a limited number of scholarships available. Follow the previous links for more details and to apply. Today’s guest is Caley Versfelt. In addition to being an actress, a professional speaker, and a board member for Special Olympics Southern California, Caley is in charge, in demand and incomparable. She grew up loved for who she is and aware of her outstanding, world-changing abilities. She embodies fun, acceptance, inclusion and passion, and she likes being who she is. As a matter of fact, everybody who meets her, likes who she is. According to Caley, herself, with Down Syndrome, and her mom Shail Versfelt, giving opportunities to individuals with special needs, spreads acceptance and inclusion, which improves their lives and the communities where they live. I’m super excited to have Caley join us here today on Consciously Speaking to share her insights and wisdom. You can learn more about her at www.CaleyVersfelt.com. This episode is being brought to you by Your Authority Blueprint Live – the 3-day event that may actually change your destiny! To learn more about this premiere event for visionary solopreneurs and take advantage of the Super Early-Bird Special (expiring 4/30/18 at midnight PST), go to www.MichaelNeeley.com or visit HERE for details. NOTE: there are a limited number of scholarships available. Follow the previous links for more details and to apply. Today’s guest is Paula Brown of Chi-Lightful. Paula is a Heartist; a graphic facilitator and purpose coach who draws out literally and figuratively the “WHAT” heart story for authentic leaders, empowering them to put the True-North heartbeat back into their lives and business. Her heart-questing was born by her heart stopping. Paula’s unique life stories and after death experience lit her purpose quest skills. She is hired by leaders to intuitively uncover their unique “essence” using both pictures and purpose discovery. Emerging from Brand Creative Director for international clients, she marries both intuition and strategic process for influencers to discover, and communicate their “what”. Paula’s Sketch-Questing and purpose coaching takes her clients into focused clarity…out of the frustration of knowing their vision and not being able to communicate it. Her best-selling book Fur Shui: An Introduction to Animal Feng Shui™, shines her intuitive tools and blue sky questing within and beyond the visible world. You can learn more about her at www.ChiLightful.com, or get access to her FREE gift at www.chilightful.com/your5steppurposequestmap. This episode is being brought to you by Your Authority Blueprint Live – the 3-day event that may actually change your destiny! To learn more about this premiere event for visionary solopreneurs and take advantage of the Super Early-Bird Special (expiring 2/28/18), go to www.MichaelNeeley.com or visit HERE for details. Today’s guest is Christian Mickelsen. He is a mentor of mine, an all around super guy, and he has coached thousands of other coaches, healers, and consultants who have built multi-six and seven-figure businesses under his direction and guidance. Some call him the master of Abundance and his latest book, Abundance Unleashed is a testament to that; as he shares his secrets to eliminating the invisible forces that could be holding you back from having everything you want in life. You can learn more about him and what he is up to in the world at www.ChristianMickelsen.com. Today’s guest is Gordana Biernat – the only European to have been named an Oprah Winfrey SuperSoul 100 Teacher. Her straightforward and empowering tweets have already inspired hundreds of thousands across the globe and today, Michael shares with her a conscious conversation about truth and how to recognize it. Gordana’s book, #KnowTheTruth will open your eyes to your true potential and inherent inner power; it will remind you of who you are and why you are here.